One of the reasons we study history is that there is something to learn from it. We're now noting that traumatic landmark in American history -- the beginning, 150 years ago, of the Civil War. As we recall what happened then, we'll hopefully consider its relevance to what is happening now. What caused a rift so deep among Americans that we went to war with ourselves and 600,000 plus had to die at the hands of their brothers? What parallels, if any, might we draw from that tragic time that will help us understand the troubled and deeply divided America in which we live today? On Wednesday, President Obama spoke at George Washington University to share his vision on how to deal with the nation's fiscal crisis. In opening his remarks, the president quite correctly noted that the debate about our national budget is about "more than just numbers on a page.....It's about the kind of country we believe in." In other words, the budget debate is most fundamentally a debate about values. The president should be commended for his clarity on this central and crucial point. When Republicans wanted to cut $350 million dollars extracted annually from taxpayers and directed to Planned Parenthood, the nation's number one provider of abortions, Democrats accused Republicans of introducing "ideology" into budget discussions. In negotiations with Republicans that could have led to a government shut down, the President pretended that the budget is exactly what several days later he claimed it is not -- "just numbers on a page." Now that the president is clear that he agrees with conservatives that the budget is about values, what are the values in question? Let's go back to the Civil War. Several years before the war and Lincoln's election as president, he and Stephen Douglas engaged in their famous debates in the campaign for the Illinois Senate seat. Douglas championed the Kansas Nebraska Act, which allowed new states entering the union to decide by popular vote whether slavery would be permitted in their state. 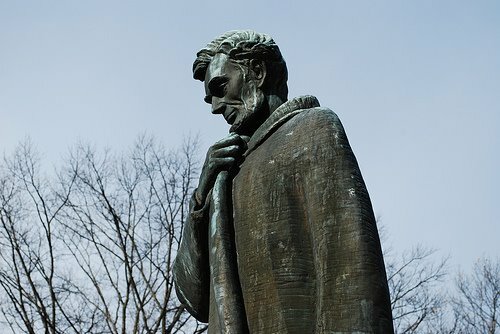 Lincoln opposed expansion of slavery into new states. Douglas argued that in a free country, choice was the most important thing. What could be more American than citizens in States deciding themselves whether slavery would be permitted? Lincoln argued that a free country must start with agreement on fundamental prior truths. He noted the Creator gave man the ability to choose but also gave him right and wrong and instructions that it mattered what he chose. This conflict in values tore our nation apart 150 years ago. A similar values conflict almost shut our government down in last week's budget negotiations. Our president, like Stephen Douglas, thinks choice is more important than what we choose. And he feels so strongly that women may wantonly kill their unborn children that he'll deny taxpayers a choice and force us to pay for it. The president was clear that he would not negotiate and would shut the government down on the question of abortion funding. A tragic irony is that just as the victims of Stephen Douglas' moral relativism were blacks, so the main victims of our black President's moral relativism are black. Black babies are the disproportionate victims of Planned Parenthood's abortion machine, poor black women are debilitated by the liberal welfare state plantation apparatus, and government workers who would have been furloughed had the government shut down are disproportionately black. At least the president has come clean that what we have is a debate about values. Now it is for the American people to choose which values are theirs.